When it comes to growth, Mini's gone Maxi. And that's true in more ways than one. First, its newest model is the Minni Countryman, an allwheel drive vehicle that is now the largest in the lineup, and the entire Mini line itself has grown from only one basic model --the coupe--when it was first introduced, to four models now. The Countryman "bridges the gapa between the4 classic concept of the Mini and a modern crossover," Mini's news release says, so you can expect a big helping of practicality along with terrific traction in a variety of road situations. Yet it still has the strong handling and cornering for which Mini has become well known. The Countryman is the first vehicle in the brand lineup to offer four doors and all-wheel drive. It has a wide-opening tail gate, a slightly elevated seating position and optimized driving comfort. Numerous features fully integrate passengers with the vehicle, while optional ALL4 all-wheel drive provides versatile capability for motoring enthusiasts who like to explore all types of terrain, Mini officials say. When you head to your local dealer to check it out, you'll see that there are three versions of the Countryman – Cooper Countryman, Cooper S Countryman and Cooper S Countryman with ALL4 – all of which will be available in early 2011. Final pricing will be announced at a later date, but the base MSRP for the MINI Cooper Countryman will be $22,350 (including $700 D&H), and a well-equipped MINI Cooper S Countryman with ALL4 will be less than $30,000. Design highlights of the Mini Countryman include short overhangs, a high window line, a powerful stance and windows extending around the entire car, together with proportions typical of the MINI brand. At the same time, the MINI Countryman subtly re-interprets the classic features of a MINI such as the roofline, the hexagonal radiator grille element, the large headlights and turn signal indicators integrated in the engine lid, the prominent wheel arches and the upright rear light clusters. As a genuine crossover, the MINI Countryman measures 161.3 inches in length, with a wheelbase of 102.2 inches (up from 145.6 and 97.1 inches, respectively, for the MINI Hardtop). One of the unusual tidbits about the Mini Countryman is the fact that for the first time the MINI logo at the rear has a specific function: Pressing the inner circle on the logo allows the MINI owner to release the tail gate, which is hinged at the top. The rear license plate recess has the same shape as the air intake located in the front bumper, linking the front and rear ends through their clear design cues. On the MINI Cooper S Countryman the rear air dam works as a diffuser, guiding the flow of air beneath the rear of the car to optimize its aerodynamic qualities. The most powerful model in the range also stands out through its special roof spoiler, a twin-chamber exhaust system and striking openings in the rear wheel arches. Completing the distinctive exterior appearance, the MINI Countryman is available with a choice of at least 11 body colors: five non-metallic, and six metallic. All models are available with the roof finished either in Black, White, or as an alternative, Body Color. Inside, the Mini Countryman combines the usual Mini innovative design elements, along with some touches all its own. The slightly elevated seating position guarantees comfort and optimizes the driver’s all-round view. The Central Display and air vents are highlighted by colored rings. The most unique interior feature is its innovative Center Rail system, which extends from the front to the rear replacing a conventional center console. It opens up new, individual options for integrating all kinds of storage boxes, cupholders, external audio devices, mobile telephones and other comfort features. It also offers flexible clip-in elements, enabling the driver and passengers to subdivide the storage boxes individually as required, keeping travel utensils within easy reach. At the same time, the Center Rail forms an unconventional, visual and functional connection between the front seats and the rear passenger compartment. 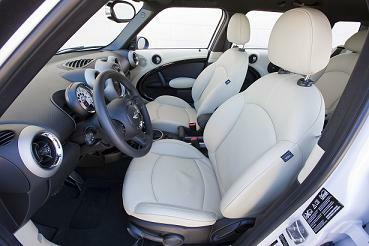 The MINI Countryman is a four seater, with two seats up front and two individual seats ini the back. The rear seats move fore-and-aft 5.1 inches independently, and the backrests may be tilted for angle or folded flat, offering up to 41.3 cu ft of space in the boot... enough for two mountain bikes with their front wheels removed. Ambient lighting, which is part of the standard light package, is a highlight of the Countryman’s interior. Providing an indirect lighting effect, ambient lighting creates color highlights throughout the entire door panel in night mode, giving the interior a truly unique atmosphere. Using a toggle switch, the driver and passengers may change the color of the light generated from a warm orange to a sporting blue. Light rods also provide the desired color on the MINI Center Rail from one end to the other. This makes it easier to find objects attached to the Center Rail. The optional interior color lines provide more opportunities to customize the car by creating different color effects along the door panels, on the center armrest side panels, the lower section of the B-pillar covers and the inserts on the Center Rail itself. The colors available are Carbon Black, Polar Beige, Pure Red, and Dark Tobacco, as well as powerful Surf Blue exclusive to the MINI Cooper S Countryman. Trim bars for the cockpit as well as a Chrome Package add discreet gloss to the air vents, the central instrument, the rev counter and the surrounds on the gearshift lever, and provide an even more intense touch of color and style. The January 2011 introduction of the 2011 MINI Countryman will include an upgraded 1.6 liter, four-cylinder engine. The MINI Cooper Countryman accelerates from 0-60 mph in 9.8 seconds. The MINI Cooper S joins the forces of direct injection and a twin-scroll turbocharger with the incredible power-enhancing and fuel-efficient technology known as Valvetronic, making the engine the most efficient in its displacement class. The MINI Cooper S Countryman accelerates to from 0-60 mph in 7.0 seconds. The MINI Cooper produces 121 hp and 114 lb-ft of torque, while the MINI Cooper S boasts 181 hp and 177 lb-ft respectively (192 lb-ft with overboost). 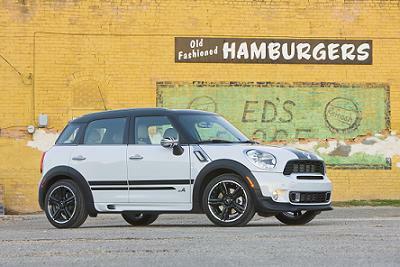 The Countryman has a 2011 EPA fuel economy estimate of 27 City / 35 Highway mpg for a combined EPA estimate of 31 mpg. The Cooper S Countryman has an EPA 2011 estimate of 25/32 City/Highway for a combined rating of 28 mpg. The Cooper S ALL4 achieves 25 City / 31 Highway / and 27 Combined. All fuel economy numbers are for models equipped with manual transmission. 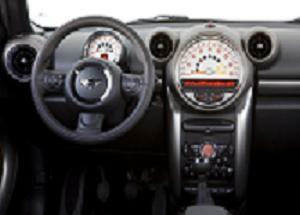 The MINI Cooper, Cooper S and Cooper S ALL4 each come standard with a six-speed manual transmission. Both models can be ordered with an optional six-speed automatic transmission that features a sport mode and includes steering-wheel-mounted paddle shifters on the Cooper S, allowing the driver to keep both hands on the wheel even during gearshifts. Mini Cooper Convertible TheMini Cooper convertible comes in for some updates for 2011. All models will have new bumper fascias, tail lamp assemblies and larger fog lights. There is a new Adaptive Xenon headlight option, and black headlight housings are newly available for Cooper and Cooper S (no charge option). There's also a new color: Spice Orange. Meanwhile, inside the convertible, anything that was covered in silver paint will now be3 matte black, and the steering wheel will have a chrome trim ring in the middle. HD Radio and Sirius satellite radio will both be standard for all 2011 MINI models (previously these options were priced at $500 each); and customers will receive a one-year subscription for SIRIUS. There will be three audio options in 2011. Standard will be a new version of Boost CD with new radio controls, with HD Radio and SIRIUS already installed. MINI Connected will be an option on all 2011 models. It will add a new 6.5” hi-resolution screen, Comfort Bluetooth with Smartphone prep, voice recognition, and a joystick controller to access all features. The third radio option will be MINI Connected with Navigation that also features real-time traffic information. The new NAV system uses an internal memory card and maps can be updated through a USB port in the glove box. As for the powerplant teams, The Mini Cooper now makes 121 horsepower,and the MINI Cooper S makes 181 horsepower. Also for 2011, anti-torque steer programming is built into electric power steering, and enhanced acoustic attenuation has been added throughout the car to reduce road and tire noise. 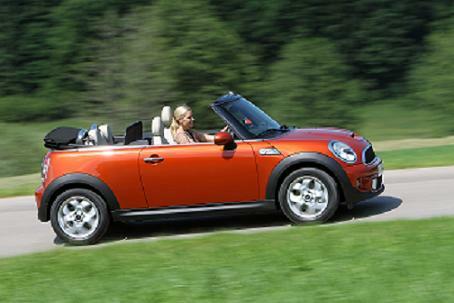 Prices for the 2011 Mini Cooper convertible lineup are: 2011 Mini Cooper Convertible $25,550 (2010: $24,550) 2011 Mini Cooper S Convertible $28,550 (2010: $27,450) 2011 Mini JCW Convertible $35,000 (2010: $34,450) Mini Hardtop All Mini hardtop models will have new bumper fascias, tail lamp assemblies and larger fog lights. There is a new Adaptive Xenon headlight option, and black headlight housings are newly available for Cooper and Cooper S (no charge option).Sunroof glass tint will change from 30 percent light penetration in the previous model to 10 percent on 2011 MY vehicles. New colors include Spice Orange and a new shade of British Racing Green II, along with Eclipse Gray metallic. Here are prices for Mini Cooper Hardtops: 2011 Mini Cooper Hardtop $20,100 (2010: $19,500) 2011 Mini Cooper S Hardtop $23,700 (2010: $23,000) 2011 Mini JCW Hardtop $29,800 (2010: $29,500) The Cooper S Hardtop has a 2011 EPA fuel economy estimate of 27 City / 36 Highway mpg for a combined EPA estimate of 30 mpg (compared to 2010 MY rating of: 26 mpg City / 34 mpg Highway / 29 mpg Combined). The Cooper Hardtop has EPA 2011 estimates of 29/37 City/Highway for a combined rating of 32 mpg (compared to 2010 rating of: estimates of 28 mpg City / 37 mpg Highway / 32mpg Combined). All fuel economy numbers are for models equipped with manual transmission.